Sammy Hayes-Rodriguez is the rather reluctant hero of this comic drama. When his mom, an engineering genius, decides it’s time he had a new ‘brother’ to take to school, Sammy is dead against the idea. There are already enough robots in his life! Sammy’s home is maintained by a host of household helpers, all robotically engineered by his mom and her team of undergraduates from Notre Dame university. Blitzen mows the lawns, Hayseed tends the gardens and Mr Moppenshine keeps the house spick and span and prepares meals so that Mom can focus on her projects and Dad has time to write his successful series of comics – Hot and Sour Ninja Robots. Despite an already very busy family, Sammy is forced to adopt a brand new ‘bro-bot’, E, and take him along to school. E makes an immediate impression and fails to endear himself to any of the cool kids making Sammy and his one friend Trip’s already precarious social standing even worse. E’s tendency to spell all the words he hears and to shout out answers in class, as well as his annoying habit of hugging his ‘brother’, not only draw the attention of the principal, but also of the school bully. Sammy pleads with Mom but E, she explains, simply must go to school, even though she can't explain why (until the final chapters!). Gradually Sammy begins to realise that having a five-foot tall, super-intelligent metal companion has certain benefits, especially when it comes to impressing girls and dealing with bullies. Through Sammy’s acceptance of his new brother, the book explores the important themes of friendship and family in a touching and subtle way that climaxes in heartbreak when Sammy and Trip are faced with separation and loss after an unfortunate incident with a peanut butter and banana sandwich! 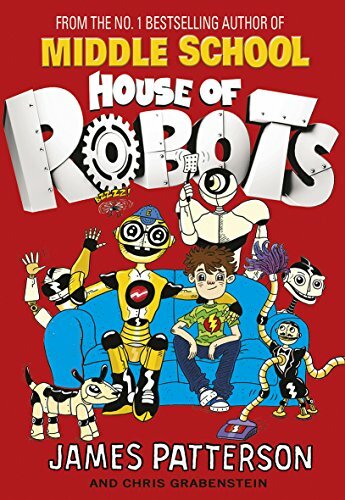 Children who enjoyed Patterson’s recent Middle School series will welcome familiar playground humour, such as the description of E as ‘slicker than two eels in a bucket full of boogers’, but in House of Robots the real enjoyment is found in the power of friendship, the world’s best bully repellent!